What is the difference between a Coffee Cake and a Crumb Cake? This was the question I got when I served my daughter a nice big wedge. I love the questions – because they really get me thinking – and sometimes I get to make up the answers – one of the benefits of being a Mom. I told her that a Coffee Cake is a cake that goes well with coffee in the morning, and a Crumb Cake is a cake with a crumb topping. They are not mutually exclusive. Improvising at it’s finest – and I think she bought it. Truthfully – I really don’t know the answer. To me, a Crumb Cake is one of these – which were forbidden in my household growing up – but occasionally I would get lucky and one of my friends would share one with me at school. When I went to college, these were definitely one of the first things I bought at the mini-mart when I was looking for a snack. Now that I look back at them though, the problem was the topping, it blended in too much with the cake. Nowadays, when I make a cake with a crumb topping, I want a real crumbly topping, one that has a little bite to it – and a texture different from the cake. 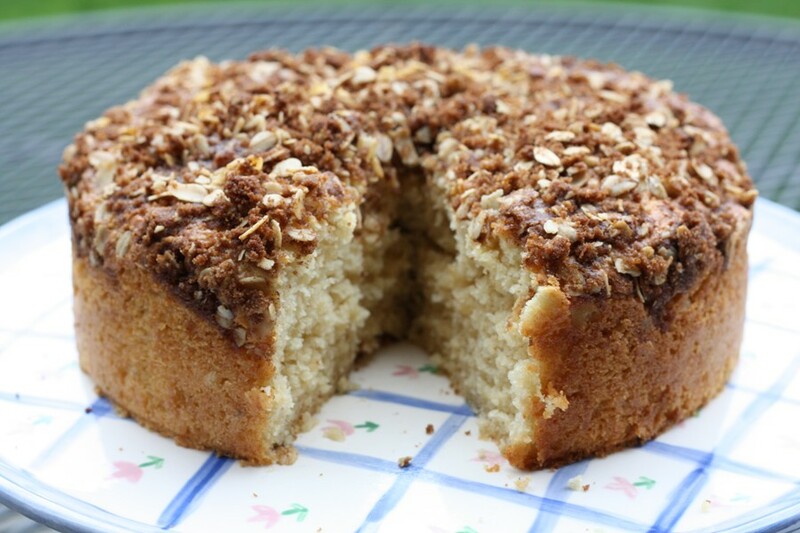 I love a good Sour Cream Coffee Cake – and so does my husband. We were at one of my favorite bakeries over the weekend – and we were eyeing the Coffee Cake in the case. It just so happened that I saw this recipe in Cooking Light, so it gave me a perfect excuse to make it. 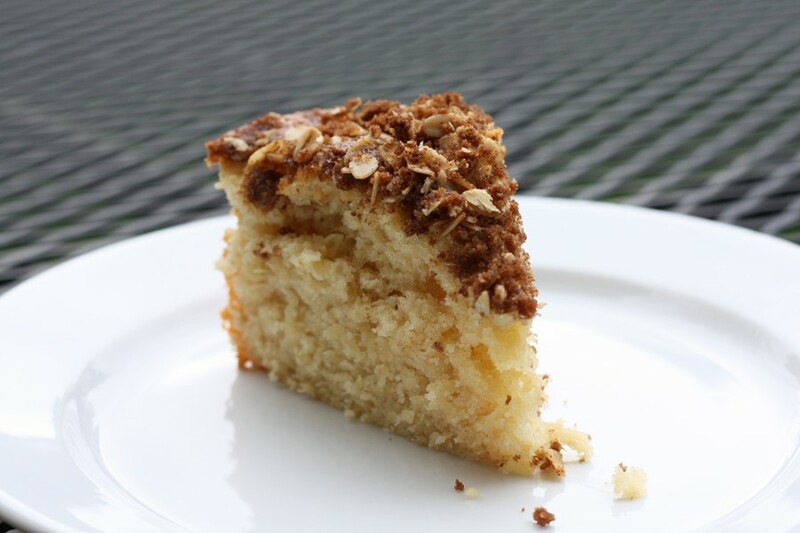 This was a delicious cake – extremely moist, flavorful – and a wonderful crumb topping. The oats gave it the perfect amount of texture that it needed. 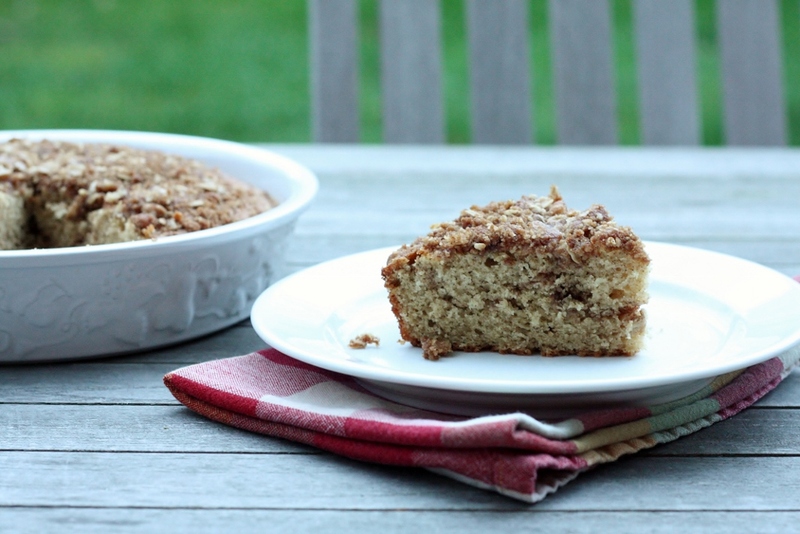 Definitely a Coffee Cake recipe worth saving. Spread oats in a single layer on a baking sheet. Bake at 350° for 6 minutes or until oats are barely fragrant and light brown. Coat a 9-inch spring-form pan with cooking spray; set aside. Reserve 1/4 cup oats; set aside. Place remaining oats in a food processor; process 4 seconds or until finely ground. Weigh or lightly spoon flours into dry measuring cups; level with a knife. Combine processed oats, flours, baking powder, baking soda, and salt; stir with a whisk. Place granulated sugar, 1/4 cup brown sugar, and 1/3 cup butter in a large bowl. Beat with a mixer at medium speed for 3 minutes or until light and fluffy. Add eggs, 1 at a time, beating well after each addition. Beat in vanilla. Add flour mixture to sugar mixture alternately with sour cream, beginning and ending with flour mixture. (Batter will be slightly lumpy because of oats.) Spoon batter into prepared pan; spread evenly. Combine remaining 1/4 cup oats, remaining 1/4 cup brown sugar, nuts, and cinnamon in a bowl. Cut in 1 tablespoon butter with a pastry blender or 2 knives until well blended. Sprinkle top of batter evenly with nut mixture. Bake at 350° for 38 minutes or until a wooden pick inserted in center comes out clean, top is golden, and cake begins to pull away from sides of pan. Cool cake in pan for 10 minutes; remove from pan.